(FAT) officially kicked off with the first restaurant in the line-up: Tadakuma. 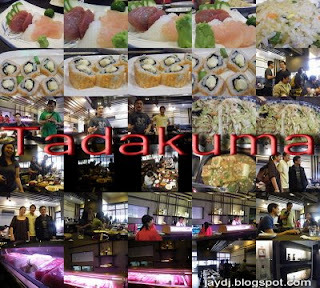 Tadakuma is a Japanese restaurant located at the Damosa Business Center in Davao City. The bloggers enjoyed a great meal indoors to complement the rainy afternoon. The wooden interiors, figurines and antiques made the Japanese experience more authentic. When we settled down, we were immediately served several dishes. It's not like a full course meal where you are served several times. Tadakuma went all out and served most of the dishes to us all at once. We were mesmerized with the foods that quickly filled our table. Since the California maki was closest to me, that was my first pick. I must say, these are one of the largest pieces of maki I've ever seen. And what I found unique about them was the way they were sliced. angle at the top depicting a diagnoal top on a flat base. It was also so soft and easy to chew. Good thing I didn't have second thoughts whether to eat the entire maki in one bite or not. Next up was sashimi. Eating the sashimi was a breeze. The best kinds of sashimi are the ones that don't require much effort in chewing. 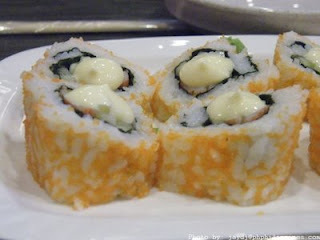 It was served along with other variants of sushi. I then took some noodles from their yakisoba serving. It was tasty with generous garnishings. I was afraid this would be spicy but it wasn't. Just enough flavor and spice without being spicy. 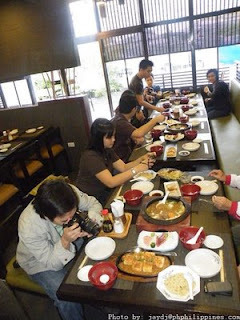 We also sampled their large servings of Atuyaki Tofu and Gomoku Chahan. The sukiyaki was the best I've tasted ever. Aside from being served in a large flat wok-like platter, the large serving was good for many. The soup base was really delicious and the soup alone was already a unanimous hit with us all. 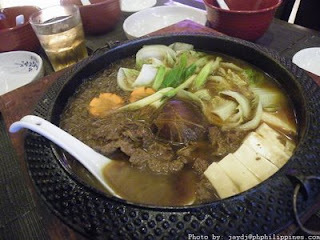 The thin noodles, tofu, vegeatables and beef added more praises to the sukiyaki broth. Everything was delicious that after declaring a very satisfied lunch and a full stomach, we just had to eat what was left. And so we went back to the maki and sashimi trays making these initial apetizers also our dessert. I really enjoyed dining at Tadakuma. The friendly owners even mingled with us to tell us more about their restaurant. Next time I'm going back to Davao, I'm definitely visiting them again. Tadakuma is located at 11 Damosa Business Center, Lanang, Davao City. You can reach them at (082) 234-8813.
by the way, meron ba silang branch sa manila? hmmm I don't think they have a breanch in manila. We met the owners di nila nabanggit na may ibang branch. hope you could visit them if you go to Davao.